This is the second post in a series about hunting for food -- truly meeting your meat. Also check out the earlier post from the series, Squirrel Hunting with Mom. I was six years old when my father and grandfather took me duck hunting for the first time. My grandparents had a cabin on Leech Lake in northern Minnesota, and every year for the duck hunting opener we would go there. Back in the early 1980s when I first got to go out in the boat with Dad, the duck season was 45 days long and there was a four duck limit. Dad would bring along an old BB gun and whenever I would get bored or start to fidget too much, he would hand me that BB gun and have me shoot one of the decoys a couple of times. For those first few years, that is what I knew of duck hunting. When I got to be about ten years old, the BB gun was replaced with a single shot break action .410 shotgun; I shot my very first duck with that gun. As I got older, the shotgun changed and so did the people I went hunting with. At thirteen, I was allowed to take Dad’s old 14-foot Alumacraft boat (with an ancient Evinrude 3 horse power motor) out all by myself. It wasn’t much of a trip, as I was only going a few hundred yards down the shoreline to an area with cattails and tall reeds, but I felt like a true duck hunter and I was on top of the world. Over the years, Dad went out less and less, and I would go out with my uncle or my grandpa, and often I would go by myself. I would take that old boat and motor down the shoreline to the same place year after year. Every year getting a little better and learning a little more. I got new duck calls and tapes to learn how to use those duck calls. I was given duck decoys for Christmas and was taught the proper way to clean and cook a duck by my grandmothers. Of all the hunting that I do, duck hunting holds a special spot in my heart because of all the people that have helped shape me into the hunter I am. My grandpa really got me interested in duck hunting and taught me a lot of skills, but the person who took that interest to the next level and turned it into an obsession was my friend and former coworker Eric Passe. 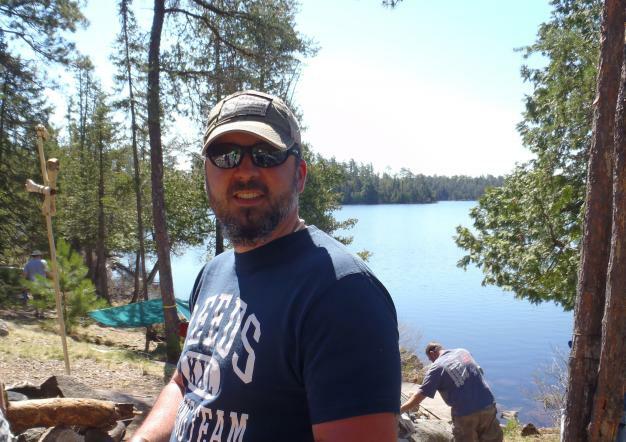 Eric lives in Wabasha, MN and has been hunting the backwaters of the Mississippi River all of his life. To say that he knows the area like the back of his hand would be a gross understatement. I met Eric about thirteen years ago while working in Rochester, MN. After talking a bit at work we found out that we both enjoyed duck hunting. Eric invited me to go hunting with him, and we have been hunting together ever since. When I first started hunting with Eric, he was hunting 45-50 days out of the 60 day season. I would join him for about half of those and we had a lot of success. These days Eric still gets out a lot and I try to join him as often as I can, usually for the opening weekend and a couple of days throughout the season. This year the Minnesota duck season opened up on September 22nd and will close on September 30th, then reopen on October 13th and stay open until December 2nd. I was unable to get down for opening day because of work, but I did get down on Tuesday the 25th. Eric and I headed down to the river around five in the morning and got the boat loaded up and headed out into the crisp morning air. For most people, navigating the Backwaters of the Mississippi River might be challenging, but Eric does it with the ease of someone passing through their own backyard. Eric took us up a channel to a small bay that was surrounded by tall trees and covered with green algae. We set up on the south side of the bay facing north and threw a few wood duck decoys out in front of us. It was 5:30 and we were set. Shooting hours start at a half hour before sunrise so we were in place a good hour ahead of time. On opening weekend it isn’t uncommon to get out there three or four hours early just to make sure you get a spot. On Tuesday, however, we only heard a few other motors running off in the distance and didn’t see any other hunters. Around 6:30 we started to hear gun shots from the Wisconsin side of the River; it was still pretty dark and nothing was flying around on the Minnesota side. 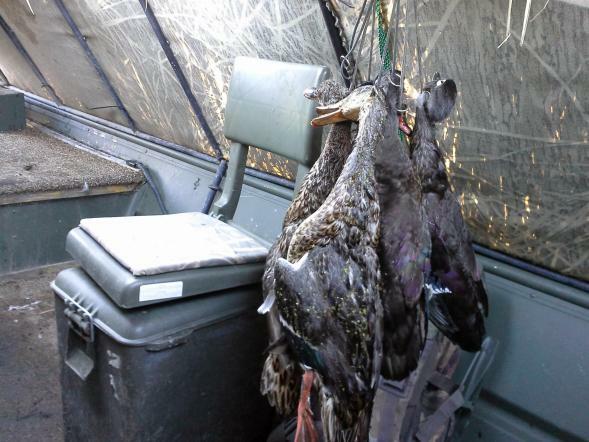 As seven a.m. approached, two wood ducks landed in the decoys, and shortly after they landed another one joined them. Eric and I jumped them off the water and dropped the first two ducks of the day. Eric’s dog Maverick, a beautiful yellow lab, retrieved both ducks and we were off to a good start. We could hear some shooting off in the distance, but for the most part it was a slow morning. We heard Canada geese honking and saw flock after flock of cormorants flying high overhead but not a lot of ducks. A few wood ducks buzzed by us and a small flock of teal landed on the far side of the bay but nothing was within range. Then Eric saw two mallards coming in across the water towards our decoys, and when they got within range Eric gave the word and we got both of them. As the day went on we added a few more wood ducks and ended with seven ducks: five wood ducks and two mallards. In all the years I have been hunting with Eric, I can honestly say that we have never been skunked. We have had some slow days and spent long hours in the freezing cold for only one or two ducks but have never come home empty handed. Eric and I have also had some really good years of hunting together when we shot 80-90 ducks total. Recent years have been a little leaner, but Eric stills get 25-30 ducks a year. I am lucky if I get ten. Back when we were getting bigger numbers, it allowed us to try a wide variety of recipes. Over the years I have made duck pastrami and roasted garlic and sage duck sausages. I have made duck gizzard confit and duck heart poutine. One of Eric’s favorite ways to fix duck is in the crock pot with cream of mushroom soup, served over wild rice. Wild ducks have a stronger flavor than domestic ducks, and while some people don’t enjoy it, I would contend that is because the duck wasn’t cooked properly. Wild ducks are a lot leaner than their domestic counterparts and require a little more attention when cooking; they can dry out very quickly if you are not careful and then become tough and chewy. By far my favorite way to eat ducks is to roast them whole – the skin get nice a crispy and the meat is packed with favor. Here is one of my favorite ways to roast a duck. 2. Stuff the onion, thyme, sage, and butter inside the duck. Sprinkle the outside of the duck with salt and pepper. Roast the duck for 25 minutes checking the internal temperature every ten minutes. I like my duck at about 150 degrees. 3. While the duck is beginning to roast, make the sauce. Combine the ingredients in a sauce pan and heat to a boil, then remove from heat. Brush the sauce on the duck whenever you check the temperature (starting at the first time you check after 10 minutes). When the duck reaches 150 degrees remove it from the oven and allow to rest for 5 minutes before carving. 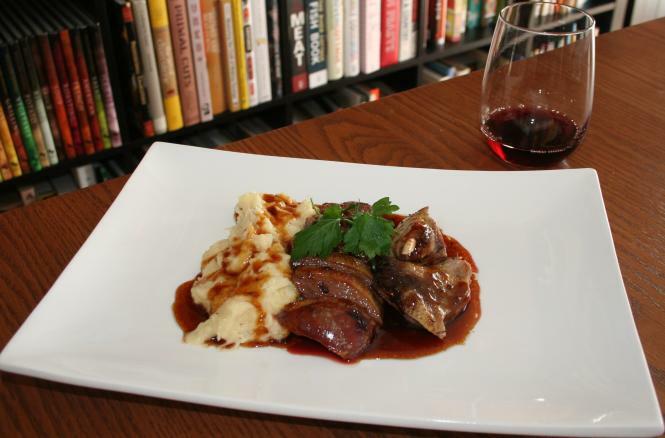 Serve with mashed parsnips and spoon the remaining sauce over the duck. 4. For the mashed parsnips: peel and cube one pound of parsnips and boil until tender. Mash together with 2 tablespoons of butter and ¼ cup heavy cream, add 2 tablespoons maple syrup and salt and pepper to taste. Jamie Carlson lives in Burnsville, MN with his wife, Amanda, and their two kids Eleanor and Charlie. He works as an Rn at the Minneapolis VA hospital. He enjoys hunting, fishing, foraging, and, of course, cooking. He believes that all food can be tasty if it is prepared with care, and he writes about his adventures cooking everything from Pickled Venison Heart to Roasted Dove on his food blog, You Have to Cook it Right. Follow him at @youcookitright. His last post for SGT was Squirrel Hunting with Mom.